Rethinking Faith and Church: Justice is Served? I remember an old funny story about two guys hiking in the woods when suddenly a big bear appears on the trail in front of him. The one guy turns and begins running like mad. The other guy calls after him and says, "You can't possibly outrun this bear. " The first guy replies, "I don't have to outrun the bear; I just have to be able to outrun you." I'm reminded of the story of Elisha who was taunted by a pack of disrespectful boys from Bethel, a city know for its apostasy (see 1 Kings 12:25-13:34). Judgement from God was swift and immediate as "two she-bears came out of the woods and tore forty-two of the boys" (2 Kings 2:24). What are we to make of that? Coincidence, harsh punishment or divine justice? The context seems to suggest that God was using the bears to deliver his justice. In another instance, a prophet that God sent to the same city, to Bethel, did not fully obey the Lord, and as punishment met his demise by another member of the the wild kingdom; a lion. "And as he went away a lion met him on the road and killed him" (1 Kings 13:24). Let me ask a couple of questions. Does God still use the wild kingdom to punish offenders today? Certainly He can if He sovereignly chooses to. Has the nature of God changed from Old Testament times to today? Does God still repay the wicked and unrepentant man for his sin? We rightly preach the grace and love of God, but have we perhaps become a little lax in also preaching the justice of God? Are not both attributes correct? God is love, but He is also Holy and just, and as such will one day, in one way or another, punish the unrepentant. "Will he not repay man according to his work?" (Proverbs 24:12). "For the Lord is a God of recompense; he will surely repay" (Jeremiah 51:56). "Vengeance is mine, I will repay, says the Lord" (Romans 12:19). "The Lord will repay him according to his deeds" (2 Timothy 4:14). "The Lord will judge his people. It is a fearful thing to fall into the hands of the living God" (Hebrews 10:30-31). "Behold, I will throw her onto a sickbed, and those who commit adultery with her I will throw into great tribulation, unless they repent of her works, and I will strike her children dead. And all the churches will know that I am he who searches mind and heart, and I will give to each of you according to your works" (Revelation 2:22-23; ESV). Did you notice that? It is the same message in both the Old Testament and the New Testament. Has the nature of God changed from Old Testament times to today? Does God still repay the wicked and unrepentant man for his sin? Here's another thought, are there still consequences for sin? Hmm. A man whose dead body was partly eaten by a bear on a remote road near Kamloops, B.C., was a convicted murderer who had been reported missing last week. The B.C. Coroner's Service and the RCMP say 53-year old Rory Nelson Wagner had been living in Kamloops before he vanished. The National Parole Board has confirmed Wagner pleaded guilty to second-degree murder in 1994. He and two others were charged with killing a Langley, B.C. man in 1993 who they believed had sexually assaulted their family member. The parole documents show the murder victim was charged with sexual assault, but was found not guilty before he was killed. Authorities say they don't believe Wagner's death in his car was a result of suicide. 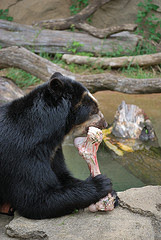 The bear dragged his body out of the vehicle, ate part of it and buried the rest. Hmm. Please understand, I am not suggesting that this man's death by the bear actually was divine justice and punishment, but that concept certainly did cross my mind, even if it was only in jest. Yet just maybe, justice was finally served after all, even if the courts and justice system couldn't seem to get their acts together to properly convict the murderer. I'm open to the possibility that we are not punished for our sins, but by them. In other words, we reap what we sow, or "according to his deeds" (2 Timothy 4:14). It's fair; it's just. And it doesn't portray a loving forgiving God as a murderous, vindictive Bogie Man. As a believer, I need not fear being punished for my sins; the cross of Christ has seen to them. Still, I do think it important to be mindful of them and to repent of them as the Spirit brings them to my mind. It's all a part of walking in the Spirit. I like what you said about being punished "by" our sins. I think that is true in the sense that there are often consequences for sin. God may forgive, but the consequence remains as a reminder of it. By way of example, consider teenage fornication. God will forgive, but the consequence may be a sexually transmitted disease, a lost school year, and/or an unwanted pregnancy. In such a scenario, perhaps the sin is punished by the sin itself as you suggest. Thanks for the comment. Blessings.